The Locke Adder C.E. 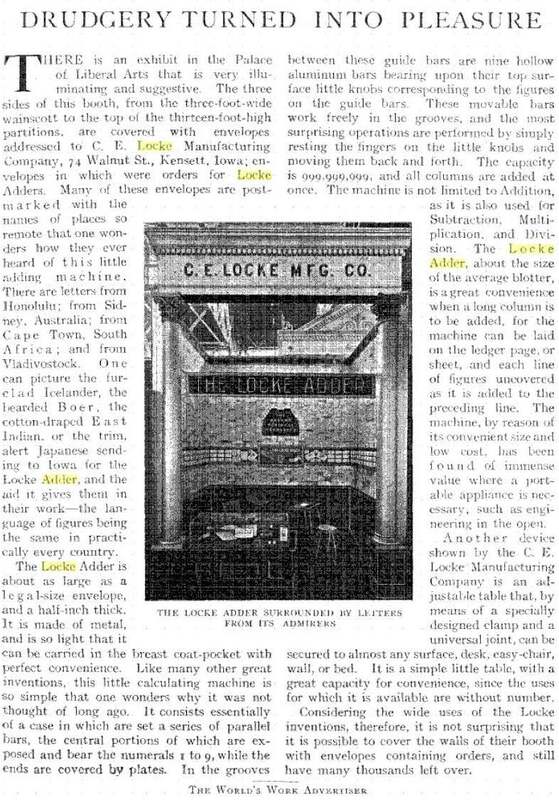 Locke Mfg. Co. The eye-catching Locke Adder, invented by Clarence E. Locke of Kensett Iowa, is a delightful example of calculating Americana from the turn of the 20th century. 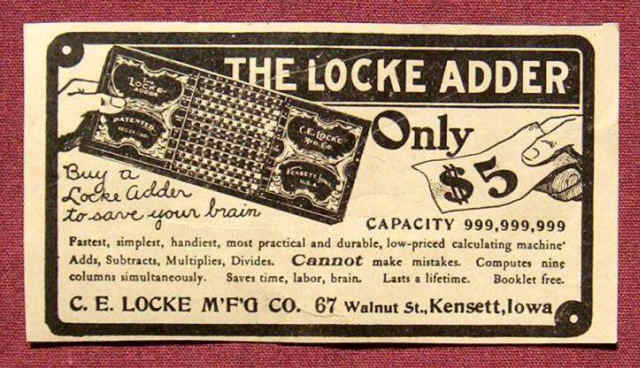 One part clever design and nine parts marketing relentlessness, the Locke Adder is very much the "American Abacus" in that its impressive appearance and affordable price made it a mail-order success story while only superficially improving upon its rustic Asian cousin. 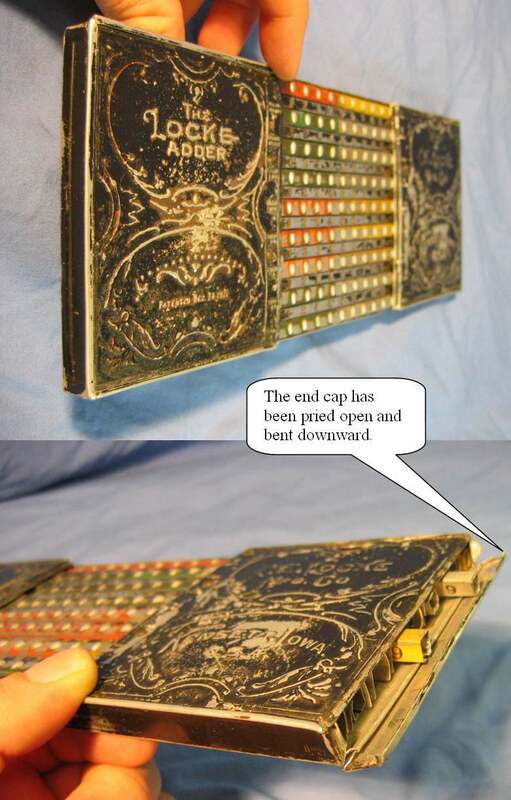 The adder is light in weight and visually pleasing, with elaborate Victorian scrollwork stamped into aluminum sheet metal painted black or copper/bronze. A set of brightly colored horizontal sliding bars of hollow aluminum are manipulated with the fingers in order to determine sums. A number is entered on a given bar by placing the index finger on the raised knob corresponding to the desired digit and sliding the knob leftward as far as possible. 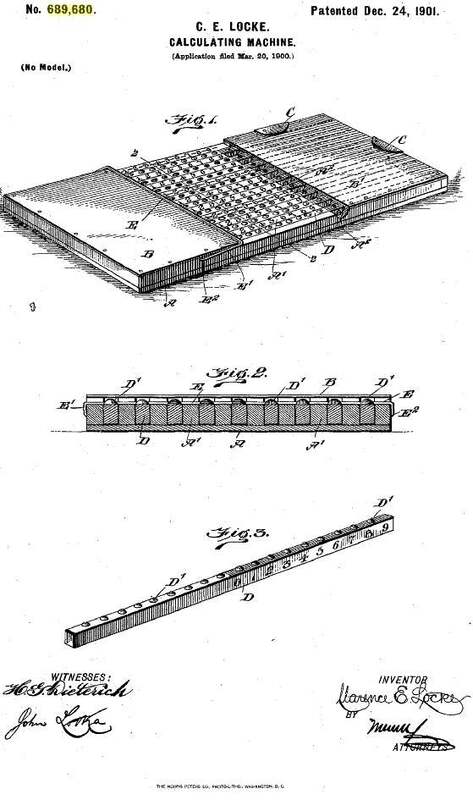 The user must account for a tens carry manually by a combination of a rightward adjustment of the current bar and the advancement of the bar above by one, much as is done with a traditional abacus. The split-colored sliders aid the user in recognizing and carrying out the tens carry operation. The resulting sum appears in the rightmost column of the central operating area. A single digit is exposed on the side of each sliding bar (when viewed from an angle), and these taken together form the answer. In the photo above, the result is 987,654,321. The result may also be inferred from any viewing angle with a glance at the center-point of each split-colored slider. 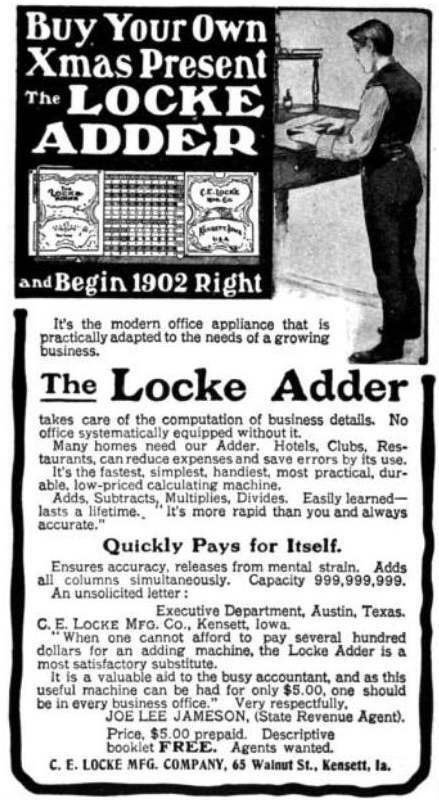 Advertisement for The Locke Adder C.E. Locke Mfg. Co. 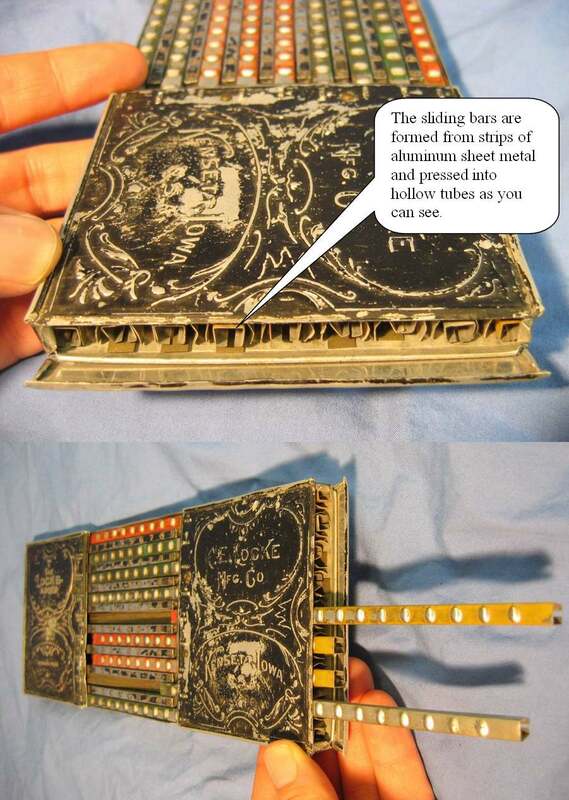 The adder was intended to be placed on the ledger, and manipulated from above, as shown in this advertisement. However the the operator must tilt his head down - or tilt the bottom edge of the adder up - in order to make out the result-- not very convenient! Also, my finger easily slips off the knob as I'm sliding a bar, and it is difficult to recover the calculation once this occurs. The operating instructions helpfully admonish us to: "Remember that the adder can make no mistakes. If you ever get an incorrect result it will be because you have failed to operate it properly." This adder is a favorite of mine for its colorful eccentricity, but all in all, it's not hard to understand why it is relatively rare -- more than a few were likely tossed onto the trash heap! 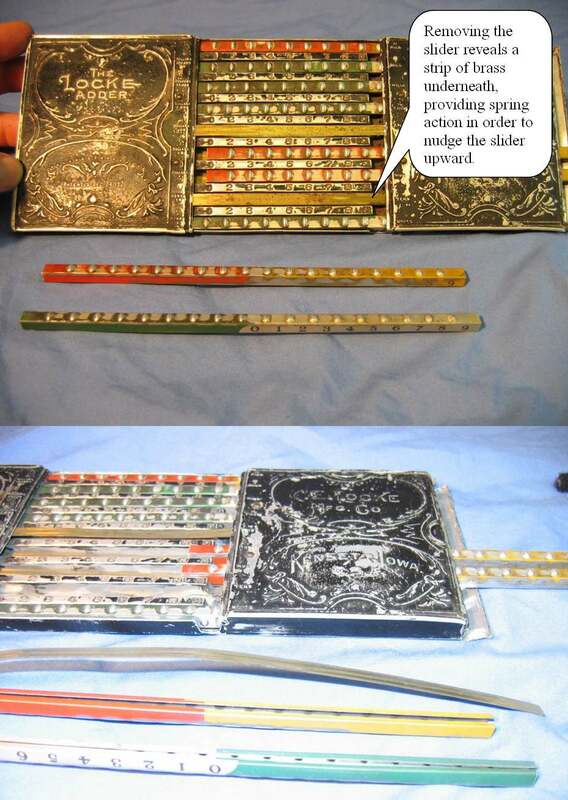 Two photos of the same Locke Adder seen disassembled above, now restored. This is a good site on the Locke Adder translated to English (courtesy of Google), and here's the original in German. This link shows an unusual Locke Adder with all red sliders. 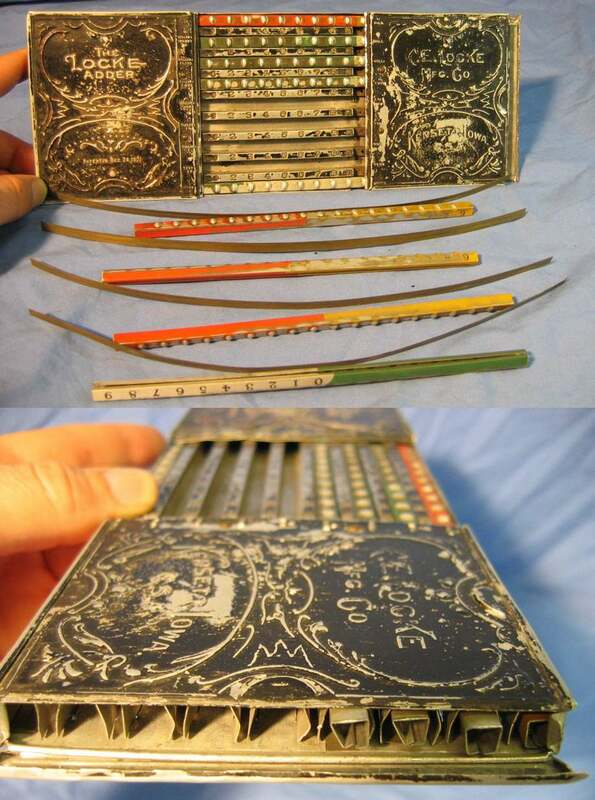 Here's a related Excelsior calculator that improves upon the Locke design. 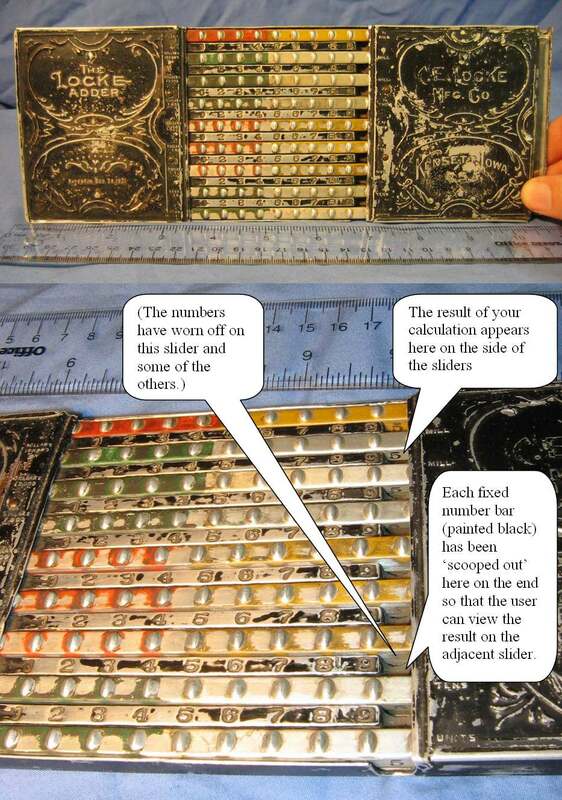 A progenitor of the Locke Adder was Fowler's Adding Machine of 1863.